* Please Note: Image is for tile representation only. This unit will feature a single cut corner design as opposed to the double cut shown above. This 48 inch by 48 inch corner stove board is designed to provide proper support for your heating appliance and protection for your home. The single cut stove board is constructed with a special thin set bonding technique to allow flexibility to ensure your board won't crack or split under the weight of your heating appliance. 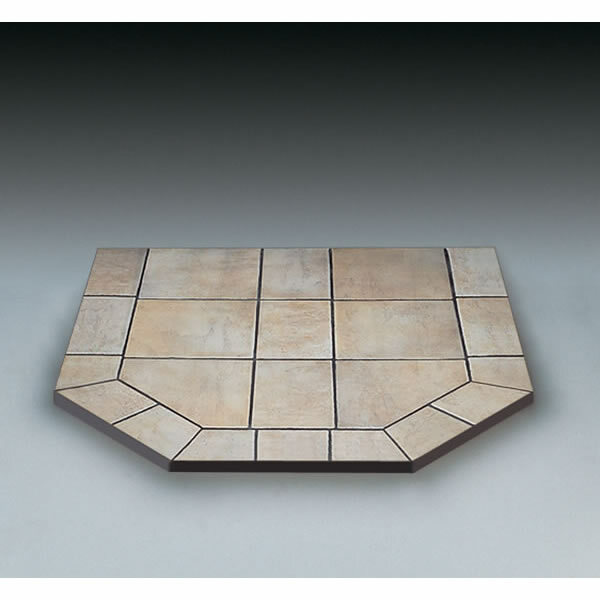 A steel frame adds extra strength and helps prevent separation and chipping of your caramel tile stove board. American Panel's board is roughly 1 1/4 inches thick. Can a stove board be used on carpet? The stove board can be placed on carpet, however almost all solid fuel appliances require that any kind of combustible floor covering must be removed from beneath the appliance before installation. As such, I recommend consulting the product literature for the stove you plan to install. How much do the stove boards weigh? Per the manufacturer, this particular panel weighs 130 pounds. 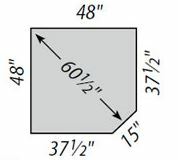 Weight will vary from panel to panel, based on the finishing material and size.